Freshwater harmful algal bloom (HAB) taxa are comprised of algae that either create health hazards for humans and/or animals or cause deterioration of water quality or aesthetic/ recreational values. By far the most problematic group, and most researched, of freshwater HABs are the cyanobacteria (formerly called blue-green algae), which form high biomass blooms and/or produce toxins, as well as taste-and-odor compounds, and have caused human illness, animal mortalities, and adverse ecosystem and economic impacts in the U.S. and worldwide. Other freshwater HAB taxa cause harm either by producing toxins that kill fish and other aquatic organisms or by forming high biomass blooms that can cause hypoxia (low dissolved oxygen) and degrade water quality in other ways. Problems related to freshwater/ inland HABs are widespread and have become more prevalent in recent decades. 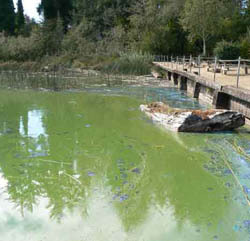 For example, toxic cyanobacterial outbreaks seem to be expanding and occurring more frequently globally and in U.S. waters, with increasing reports of harmful species emerging in areas not having problems in the recent past, such as the cyanobacteria Cylindrospermopsis in eutrophic lakes in Florida and in Chesapeake Bay tributaries in Maryland. In addition, cyanobacteria-produced toxins and taste-and-odor compounds are becoming more of a problem in drinking water reservoirs, and off-flavor compounds have become particularly problematic in aquaculture operations. Non-cyanobacterial inland HAB events are increasing in some locations as well. For example, the golden alga, Prymnesium parvum, which became a problem in Texas in the 1980’s, has caused fish kills annually since 2001 and has now spread up the Pecos River into New Mexico. Algae proliferate when multiple interacting biological, chemical, and physical factors act synergistically to create an optimal growth environment. Those optimal growth conditions vary among algal species, even within the freshwater HAB taxa. While HABs occur naturally, human actions that disturb ecosystems in the form of altered nutrient regimes, modified hydrology, introduced species, modified food webs, and increased pollutant inputs have been linked to the rise in some freshwater HAB outbreaks.